120 YEAR OLD BREWERY CORNER SIGNS RECENTLY REUNITED! Recently I was fortunate to have been able to acquire the metal Klausmann Brewery beer corner sign featured on the left side in this photograph from a fellow pre-prohibition era breweriana collector. While I owned the Anheuser-Busch sign first pictured on the right, I was very interested in pairing the two similar designed signs, particularly because of how they were found together about 30 years ago after sharing space in a small saloon attic in St. Mary’s MO for at least 80 years before they were rediscovered. Incredibly both of these signs were paired with a second similar sign, making the find a total of four 1900 era corner signs located in one spot! Because they had been protected, the signs remain in very nice condition overall for their age. Early advertising collectors know how unusual this find was since very few outdoor corners signs from the 1900 era even exist today. To further prove how rare these type of pieces are is the fact each of these corner signs remain to be the only four known of these styles to exist in early advertising collectors hands. 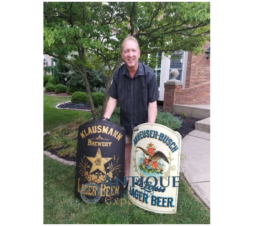 Today the MO History Museum in St. Louis has the second identical Anheuser-Busch sign from the find, while the second Klausmann sign is in a private collection. 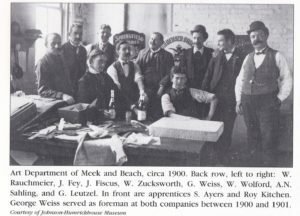 Featured here is a photograph circa 1900-1901 from the Meek and Beach Advertising Company in Coshocton, Ohio showing the sign manufacturers art department team. If you look closely to the right rear, you will see the exact same Anheuser-Busch corner sign standing upright behind the men! This photograph certainly helps verify the signs age, and matches the sign makers name on the very bottom of the AB sign right side. Today Anheuser-Busch is better known as part of the largest brewing operation in the world via their parent company, Inbev. Their flagship Budweiser brand has been the number one selling beer worldwide for decades. The smaller regionally based Klausmann Brewery was also based in St. Louis, MO and was in business for the better half of 20+ years. The south side brewery was based in the Carondolet neighborhood and probably had a market service area of about 100 miles or so from the city of St. Louis. Finding Klausmann Brewery items today is very difficult, but a worthwhile search! THE WHISTLE GOLDEN ORANGE DRINK ELVES SOLD A LOT OF SODA!DID THE CHATTANOOGA BREWERY USE A MAP TO SELL THEIR PRODUCTS?